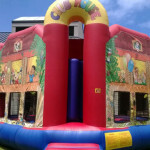 Deluxe Combo Jump is a 20ft x 25ft bouncer that has a dry slide, basketball hoop, bumper maze and jumping all on the inside. Lots for the kids to do in this activity bouncer. 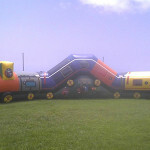 Price: $250.00 for 4 hour rental or $280.00 for 3 hours with attendant. Extra hours available upon request. Princess Combo is the perfect choice for all the little princesses out there. 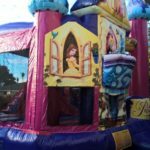 This 15ft x 15ft bouncer has a dry slide, basket ball hoop and jumping all on the inside of this enchanting party pleaser. 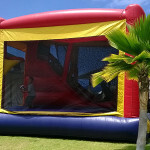 With an inside bounce area of 13 ft x 13 ft, this small sized bouncer makes it easy to add a special touch to tight areas. Price: $200.00 for a 3 hour rental with attendant or $160.00 for a 4 hour rental without attendant. This bouncer has a jump area of 15ft x 15 ft. Club House arch on the front and hexagon shape makes this bouncer an original. Weight limit is 120 lbs. per child. Price: $220.00 for a 3 hour rental with attendant or $180.00 for a 4 hour rental without attendant. 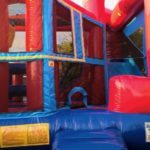 Large activity bouncer with inside area of 20ft x 20ft. This bouncer has a dry slide, basketball hoop and jumping area on the inside. It also has interchangeable banners to personalize your event. Happy Birthday, spider man, hula girls, under the sea, and holiday theme banners available. Weight limit is 120 lbs. per child. Price: $260.00 for 3 hour rental with attendant or $220.00 for a 4 hour rental without attendant. 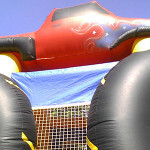 This bouncer has an inside jump area of 15ft x 15ft and will keep them going off road for hours. Truck is 18 ft high and has a weight limit of 120 lbs. per child with a 7 person maximum. 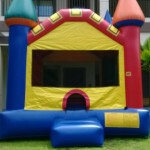 Price: Price: $220.00 for a 3 hour rental with attendant. Drop off special pricing is $180.00 for 4 hours without attendant. This 35 ft long walk through maze has a mini slide, control room and sitting area inside. Weight limit is 120 lbs. per child with a maximum of 4 children at a time. Price: $250.00 for 3 hour rental with attendant. Drop off special: if no attendant is required, you get an extra hour free for a total of 4 rental hours plus a rental discount of $25. Total price $225.00 for 4 hours without attendant. If you are doing a Drop off Special rental there must be a person available to monitor the bouncer during the entire rental time. No shoes, food, drinks, candies, gum, or items containing sharp or ruff edges may be allowed in the bouncer. If bouncer is found to be excessively dirty at pick up time (dirt, rocks, rubbish, candy or food, wrappers, staining from paint or other materials) a $20.00 cleaning fee will be required at the time of pick up.